My adventure this weekend was originally intended to be a day trip for the Matějská pouť, returning to Dublin on a Sunday morning flight. I'd hoped to travel with Ryanair, but their return flight wasn't an option for me as Priority & 2 Cabin Bags had sold out, the standard dimensions of 40x20x25cm being a few centimetres too small for my laptop bag. The Aer Lingus alternative was scheduled for early evening, and though it was marginally more expensive I decided that it was a better bet, not least because it opened up the possibility of some credit whoring. Merlin's Kinderwelt is part of Excalibur City, a tourist trap located close to the border between the Czech Republic and Austria. I'd driven past it on my way to Auschwitz back in May 2016, but it was closed at the time. 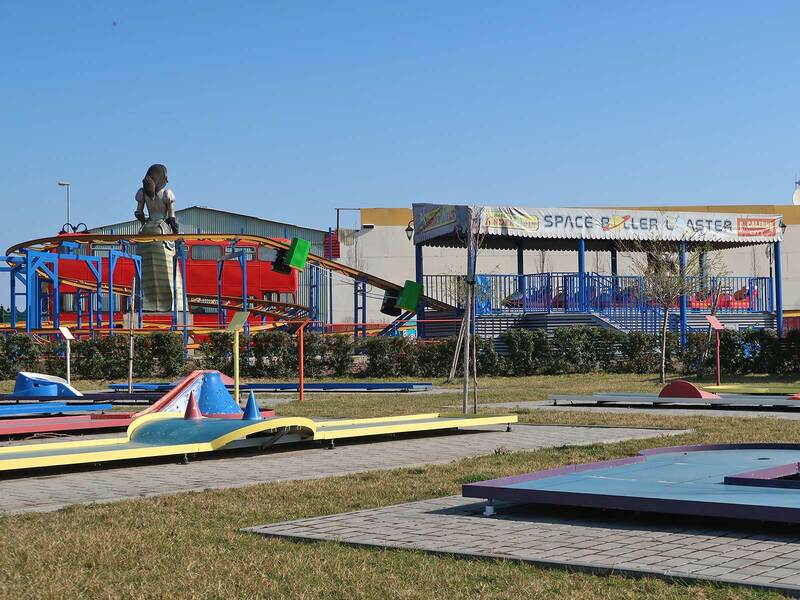 Everything was supposed to be operational today, but for the second time this year information found on a park web site proved to be inaccurate; signage on site revealed that one whole section of the amusement park was closed "until Spring". The padlock on the gate made it clear that no amount of negotiation was going to get me access to the Space Roller Coaster, despite the fact that I was visiting ten days into the season on a day where the outside temperature was warm enough to walk around in a t-shirt. I walked around the outside of the affected area to snap a few photographs of a coaster that I don't expect to get back to any time soon. The park has no admission fee; instead ride tokens are sold from vending machines around the park. These only accept cash and do not give change, though on the plus side guests have the option of paying in both CZK and Euro. Having equipped myself I dropped two tokens into the slot for Butterfly (#2588), a Sunkid Heege machine without an external start button. The ride was exactly what I'd expected it to be; a pleasant if not particularly memorable experience. A quick check of my phone revealed that I've now ticked off thirty-five of the eighty known installations globally, and though that seems like an obsession it's worth reminding the reader that one well-known European British enthusiast managed to complete the full set a few years ago. I joined a group of locals on Sliding Caterpillar, a powered coaster barely worthy of the description. With five people in the train the poor motor was struggling badly, and though we sped up very slightly for each descent the train remained below walking pace, a definite signal that the hardware is coming to the end of its service life. The experience was very reminiscent of the machine at Zomin Istiroxat Bog'i, though this installation earned at least a few points in my book for its theming, which featured a fiberglass apple supported on wooden stilts, assorted farmyard animals, and a wooden hut. When the time eventually came to disembark I deposited my remaining tokens on top of one of the vending machines and made my way back to my car. My second stop today was a last minute addition to my plan written in as an optional stop to be cut from the day if I ended up needing more than an hour at Merlin's Kinderwelt. My GPS led me onto a road that felt like a satnav moment, an impression exacerbated by the number of pedestrians walking on it, but in due course it led me to a small car park in front of a restaurant. There was no obvious activity there, but an adjacent Alpine Coaster looked to be doing a good trade. Bobovka is a generic yet enjoyable Wiegand installation that costs 60 CZK (~€2.33) per circuit. Sleds are spaced forty seconds apart using a countdown timer at the loading platform, which is at the base of the lift hill. The official web site mentions automatic safety braking, but this wasn't noticeable today; in fact, riders were being encouraged to go as quickly as possible. There was a digital display about half way down the track showing my speed against the day's maximum of 40.9km/h, which I suspect to have been achieved by two adults sharing a sled; I managed a respectable 37.8km/h on my first ride and 38.2km/h on the second. 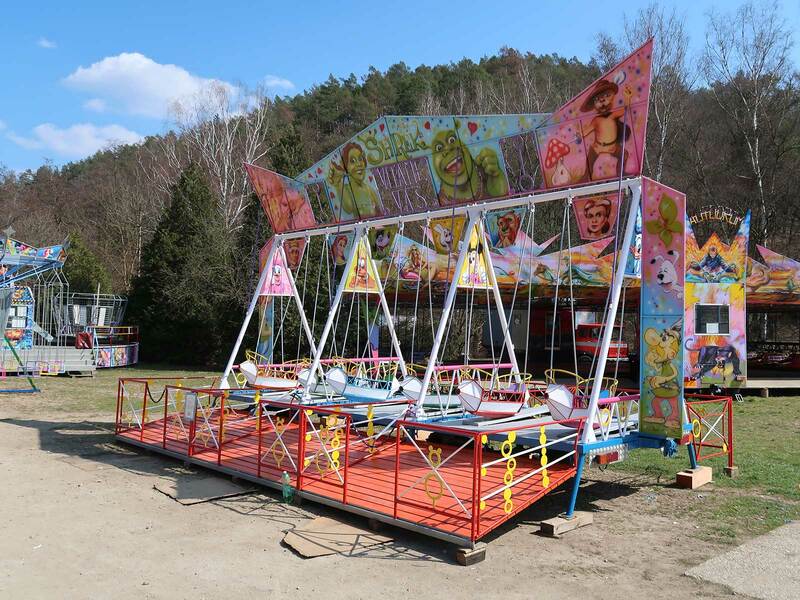 On my way back to the motorway I happened to spot a small funfair. Parking in the vicinity was far from straight forward, but after ten minutes of driving in circles I eventually found an open spot. The rides were closed until evening, but the bright sunshine allowed me to take a bunch of very colourful photographs for my archive. Those seeking to retrace my steps should point their GPS at 49.2042, 16.7161.